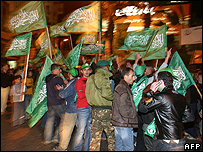 Palestinian militant group Hamas has won a sweeping victory in municipal elections in the West Bank. The Palestinian electoral commission said that in the biggest city, Nablus, Hamas took 73% of the vote, while the mainstream Fatah organisation took 13%. Nablus has traditionally been seen as a Fatah stronghold, but the party appears to have been damaged by current splits. 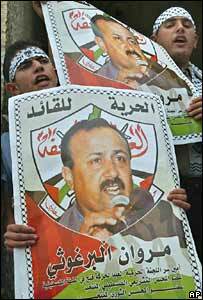 On Wednesday, Marwan Barghouti split from Fatah to form a rival faction for elections in late January. Barghouti is serving five life terms in an Israeli prison for ordering militant attacks. This week's poll is viewed as an important indicator for elections to the Palestinian parliament scheduled for 25 January 2006. Partial results suggest Hamas has taken control of the councils in Nablus, the most populous West Bank city, and al-Bireh, a large suburb of Ramallah. In Jenin, Hamas won seven seats on the council to Fatah's six seats. In Ramallah, the West Bank's commercial centre, Fatah won six seats on the council, while the radical Popular Front for the Liberation of Palestine also won six and Hamas three. Full and final results were expected by the end of the week. Hamas' charter commits it to the destruction of Israel, and the group has been responsible for most of the suicide attacks inside Israel. Israeli officials have warned that the peace process will end if the group becomes the dominant Palestinian political party. Late on Thursday Israel launched another round of missile strikes on targets in Gaza and Palestinian militants fired Qassam rockets into Israel. The Israeli army said its missile strike was aimed at roads leading to areas from which militants fire rockets. Palestinian medical sources say that two people were injured.